PC Speakers come in a variety of sizes, and for a number of different uses. 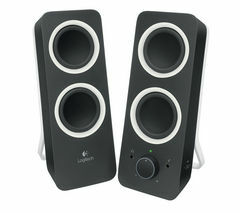 From simple 2.0 computer speakers to entire 5.1 surround sound models, there are many options and all at brilliant prices. The first port of call is to identify exactly what you’re needing the speakers for. If you’re looking for a simple pair of pc speakers to emit good quality sound then you’ll find a range of prices from around £10 upwards. If you’re looking for a little more wow factor then you’ll benefit from features such a wireless connectivity to keep your home or office tidy on some options, as well as sub woofers for most of the mid to higher end models. If you’re unsure of which manufacturer to opt for, then take a look at our range of Logitech PC speakers, offering superb build and sound quality at affordable prices. 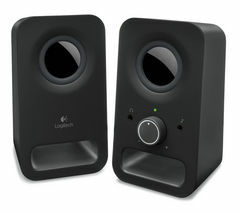 Logitech were one of the pioneers of good quality speaker manufacturing when desktop PCs first made their way into our homes, and they continue to be a leading force. If you’re looking to further improve your home computer system then you can bring your desktop or laptop into the modern age with one of our webcams. All of the webcams come with built in microphones, and are priced from simple models to full HD quality webcams. Whether you’re looking for value for money or to go all out on your computer speakers and home computer system, we’ve got the right kit for you.